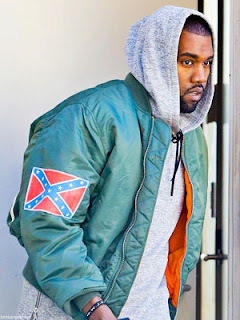 Strange News Video: Kanye West Fights to Keep the Confederate Flag Cool! Kanye West Fights to Keep the Confederate Flag Cool! In the strangest of affinities, Kanye West has used his business acumen and foresight to make sure the market for confederate themed merchandise continues to thrive. The savvy businessman knows that as soon as mega-corporations like Walmart determine that someting is no longer 'cool', the cool kids just want it that much more. Predicting a massive resurgence in confederate flag fashions in super-cool 'southern sounding' places like 'Williamsburg', Kanye, earning extra points for being 'first' on the trend in 2013 has launched a line of confederate flag fashions and videos where is his goal was to "take white trash T-shirts and make it into a video."